Summer vacation gives kids more opportunities to enjoy the outdoors and play in the backyard. Unfortunately, there are opportunities for injuries and accidents if homeowners are not aware of certain backyard safety risks. If you have a backyard, be on the lookout for areas that could be dangerous for you or your kids. Whether your kids enjoy a swing set, a jungle gym or a playhouse, be sure to do annual checkups on their playground equipment. Check for rust or splinters that could harm your child. Check chains on swing sets and jungle gyms for any loose or mangled links, which could catch on clothing or break during use. Test any equipment to be sure that it is securely fastened to the ground. Most importantly, install protective surfacing around the playground equipment. 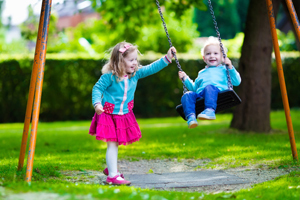 Most playground injuries result from trips and falls. By having a soft, kid-friendly surface, your child will be less likely to be injured seriously from a fall. Any outdoor toys should be properly stored in a dry, secure place when not in use. Outdoor toys scattered around the yard can become tripping hazards, or become projectiles if a mower accidentally runs across one. By keeping outdoor toys in a secure area, such as a shed, you can also prevent the toys from becoming damaged by weather or animals. If you own a trampoline, be sure that it is both installed correctly and securely in an area away from clotheslines, fencing or other hazards. Check the condition of the mat and net before allowing children to play on the equipment. Even if you own a fairly large trampoline, it is best to only allow one child play on the trampoline at a time. This reduces the weight the trampoline endures, and also prevents children from knocking into each other, causing injury. If your kids love to climb, there may be very little to prevent them from exploring the branches of your backyard trees. However, you can ensure that the trees are safer for their vertical explorations. Check the health of the trees in your backyard. Be sure to remove any weak or rotting branches that could break. When your child has finished playing outside, be sure to check them for ticks.